So I skip it, not that it was ever funny. I worked with this boat captain several years back. Before every trip he would make the guests go around and say where they were from. When someone announced they were from Texas we’d burst out with all the pent up enthusiasm we could muster, “welcome to America my friend!” They either loved it or hated it. I haven’t used that line in forever. I gloss over that one too. They introduce themselves. Bruce and Gail. Even their names sound like Texas. But they’re friendly, oh so friendly. Bubbly, energetic, polite, talkative. In their mid-60s and on their third trip to Alaska. They love it here. They’ll remind me of that ten more times before the day is done and I’ll appreciate it every time. They’ll marvel at the beauty, coo at sea lions and otters, stare with hungry eyes at a breaching whale a quarter mile away. To hear them talk it may as well have shaken their hand. Perhaps they sensed it like I did. That when it came to politics, to life, our ethics, we stood on opposite ends of the spectrum. But here is the beauty, the magic, the power of this Bay. It makes all that stuff irrelevant. Here is common ground. The otters are arbitrators. What would it be like if our Senate and House of Representatives met here, inches above the water. Would some of this melt away? Let’s make a Republican paddle with a Democrat and see what happens. Forget crossing the aisle, see if you can cross Bartlett Cove. For seven hours the talk is easy. The conversations are light. They own a ranch, 2,000 acres of Texas desert beauty. Bruce grass feeds his herd. He brings inner city kids out every year, teaches them to hunt the deer that flood their property. He show them everything from pulling the trigger to cleaning, packing, and preparing. Reminding them that food does not appear on the Wal-Mart shelves through some sort of Harry Potter spell. They’re involved in wildlife conservation. Fighting to keep the areas near their ranch wild. Teddy Roosevelt Republicans. How amazing, that the father of conservation was conservative, was buddies with John Muir. I mention the parallels and Bruce nods. The trip ends. But they’re not sick of me yet and invite me up to the lodge to have a drink. For a moment I hesitate. But I’m intrigued, so intrigued by what is happening here. By the opportunity to have what Melanie Heacox would call, “the interpretive moment.” Sometimes a cold beer in the revelry of a magic day is that moment. Halfway through the first beer the door cracks. 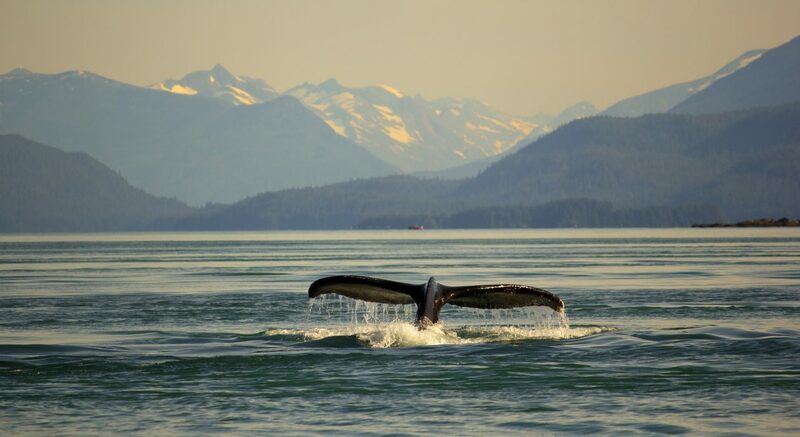 “Where’s one place that you really want to visit in Alaska?” Gail asks. Gail’s face alights. “It looks beautiful.” She says. Like most people, she’s seen the pictures. They’ve been to Denali, the Alaskan Serengeti. “This is supposed to be like Denali on steroids.” I say. Bruce leans forward. He’s a talker, not one to sit back and listen. “What’s up there?” He asks. “That’s where the oil fields are.” Bruce finishes. I nod but say nothing. Our talks all day have been civil. And even now there’s no threat in his voice. Nothing that’s inviting confrontation. If only we could always talk like this. Maybe we’d get somewhere. It’s hard to tell what sort of impact the story has. “One drunk boat captain.” Bruce says. I point out over Bartlett Cove, in the distance beyond the forests of Lester Island are the Fairweather Mountains. The view the three of us have been marveling at them all day. “There’s precious few places like this left on the planet. We need them. We can’t exist without them.” They agree, they understand better than most that nature equals life. I’m not expecting a deathbed conversion. Not expecting them to change their voter registration to democrat. To start a non profit climate change research association. But I want to be heard. Just like they do. Like we all do. “We have no love for Trump.” Gail interjects. I doubt I’ll ever see Bruce or Gail again. And at the end of the day, doubt that anything in their minds has changed. Strip all this stuff away and we’d be friends, were friends for an afternoon. They’re sweet people, loving people, giving people. They work hard, play hard, the sort of people that would pick you up and set you back on your feet without a second thought. But that look in Gail’s eyes when she realized that Ahnwarrr was the refuge. That that was the place under siege. Maybe something stuck there, in the back of her head. And maybe next time it comes up she won’t see oil rigs, drills, or platforms. Maybe she’ll see the Caribou running across the tundra, and a young kayak guide, his eyes full of meaning talking about how badly he wants to run with them.